Tag clouds or word clouds have become quite popular on blogs to indicate popularity of words used, they offer an easy to see visual representation of words used in the blog. Use a word cloud generator to create your own or contact us for details of our graphic design service. Wordle, a tool for generating word clouds. Just add text and greater prominence is given to words that appear more frequently. Use different fonts, layouts, and color schemes. Tag Crowd, create your own tag cloud from any text to visualize word frequency. 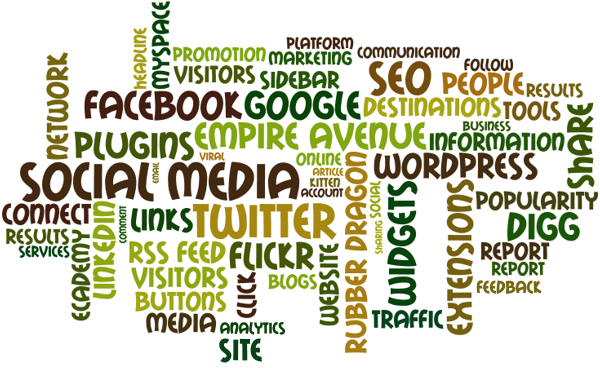 The graphic below showing social media networking words was created in Wordle and the bunch of words was created with the help of Tag Cloud, both services are free and really easy to use. See more of our tag clouds and graphics at Flickr.